For as long as anyone can remember, every Christmas at the Italian Home hundreds of friends have opened their hearts and generously donated gifts for the children in our care. Unfortunately, with so many kids to care for and new ones arriving nearly every day, by June this year our toy closet was starting to look a little empty. That’s when our friends at Bain & Co. decided to step in and make a difference. Summer is one of the best seasons at Italian Home. Between therapeutic summer camp, day school summer session, and residential kids, there is always a group swimming in the pool, playing on the soccer field, or riding bikes. Everywhere on our campuses you can hear the laughter of kids having fun. But summer isn’t fun if you don’t have the beach toys, swimsuits, balls, pool toys—and safety gear like bike helmets—that make it possible. That’s why we created our “Summer Toy Drive Wish List” and shared it with the generous folks at Bain & Co. They even incorporated it into a friendly competition at their corporate retreat, pitting teams against one another to see who could be the most generous. Almost immediately the items began pouring in—badminton sets, bubble machines, bike helmets, and even a basketball hoop for our pool. Soon our toy closet was filling up again. 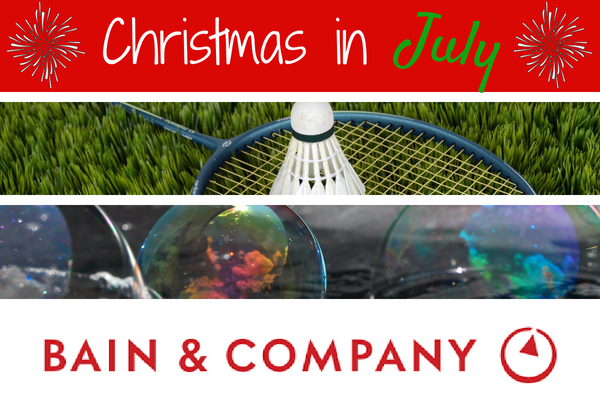 We’re so grateful for Bain & Co.’s generosity—without them this summer would not be as fun for the kids at the Italian Home. If you want to contribute to summertime fun at the Italian Home, there are still a few items left on the list that our kids could really use. Click here to see what we’re looking for and check out our Facebook page for more photos and videos of summer at the Italian Home. If you are interested in organizing a corporate gift drive or bringing a group to volunteer with us, please complete our online form here.